Zalambessa area residents demanded answer as to why the Ethiopian force in the region is abandoning its position along the border area. A contingent of the Ethiopian Defense Force, which was stationed along the Ethio-Eritrean border, was blocked yesterday in the evening near the border town of Zalambessa as it was withdrawing heavy weaponry from the region, reported BBC Amharic. It happened in Fatsi which is close the Zalambesa. More than 20 military camions carrying heavy weaponry were unable to move from the region. Security chief in the region, Girmay Hadush, confirmed to BBC Amharic that the incident happened. 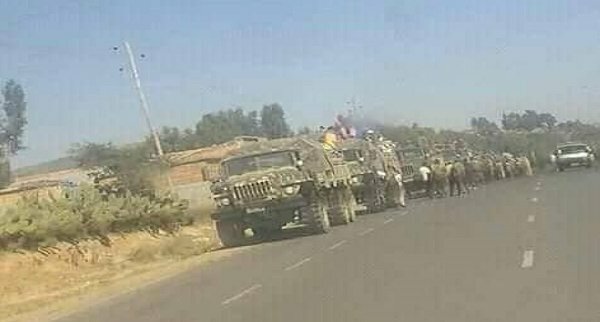 It was residents in the area who blocked road with the intention to express their opposition to the withdrawal of the defense force from Ethio-Eritrean border in the region. “People in the region demanded explanation about removal of heavy weaponry,” Hadush told BBC Amharic. “In a situation where borders are closed, where is the Ethiopian force moving to? The reason for the decision to move the force from the boarder is not clear. These are the questions of the people,” said Girmay explaining the opposition from the people. And it was peaceful, and no security incident happened, he added. Commanders of the Ethiopian force in the area were compelled to sit with residents for a discussion today in the morning and agreement has been reached according to security head of the district, Girmay Hadush, who spoke to BBC Amharic. They reportedly explained that their withdrawal from the area is not permanent and that a new force will take over the border area. However, residents did not seem to buy the explanation. Commanders of the forces in the area have understood the skepticism about removal of defense force from the border and they have agreed to stay in the area until a new force arrives. Heavy artillery and tanks which were meant to be moved from Ethio-Eritrea border town of Zalambessa are also to remain the in area.